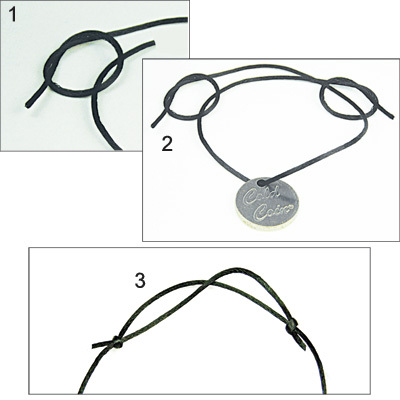 Make a sliding knot necklace for your Cold Coin with our easy directions and this black Satin cord. 1. Slip one end of the satin cord through the hole in your Cold Coin. 2. Take your length (30") of satin and tie a simple overhand knot around one end of the cord with the other end. 3.Take the untied end and tie another simple overhand knot around the cord somewhere in the middle. 4. Tighten both knots so that the satin slides through but is still snug. The necklace is now adjustable to slip over your head or to hang in different lengths.